According to the South African Petroleum Industry Association about 20% of the country’s fuel needs are being met by refined product imports. These are expected to continue to increase, unless significant investments are made in the country’s six refineries. Some have argued that South Africa should take advantage of the global glut of liquid fuel refining capacity and rely increasingly on fuel imports. Government contends, however, that importing fuel is not positive – neither in respect of energy security, nor for the enhancement of industrialisation. It also believes that a high level of refined fuel imports exposes South Africa to foreign exchange fluctuations and could place energy security at risk. Thus, much uncertainty remains in the domestic upstream and downstream oil and gas sectors. 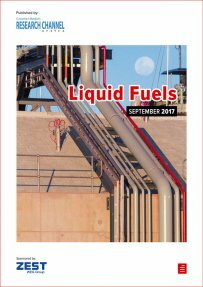 Creamer Media’s Liquid Fuels 2017 report examines these issues in the context of South Africa’s business environment, including South Africa’s refining capacity; the proposed introduction of Clean Fuels 2 specifications; the development of the country’s biofuels industry; fuel pricing; the logistics of transporting liquid fuels; oil and gas exploration, as well as projects currently under development. Published on: 15 September 2017.